On balance it was a very good day at Lionel and Lucinda’s. A day of many parts. It was Flying Ant Day; a curious and slightly sinister version of Formicidae relocation. It was a Day of Welcome Gifts, of cut and come again and rocket, of home-made mackerel pate and elderflower cordial. On the downside it was a Dig up a Truck Load of Crocosmia in the Vain Hope you will get Rid of Them Day and a Swelter in the Unexpected Summer Weather Day. Far outweighing the hard slog was the Fall in Love all Over Again with Cosmos from Cerise through Pictoee to Virgin White Day. All in all there are no complaints. Cosmos are lovely! Very cheerful. Interesting, here the ‘flying ant day’ is happening later in the fall. They are my favourite annual (probably), I just love them! I grew some wonderful Cosmos in my very first garden. Is it just me, or are they coming up with hybrids that aren’t nearly as nice as the original? 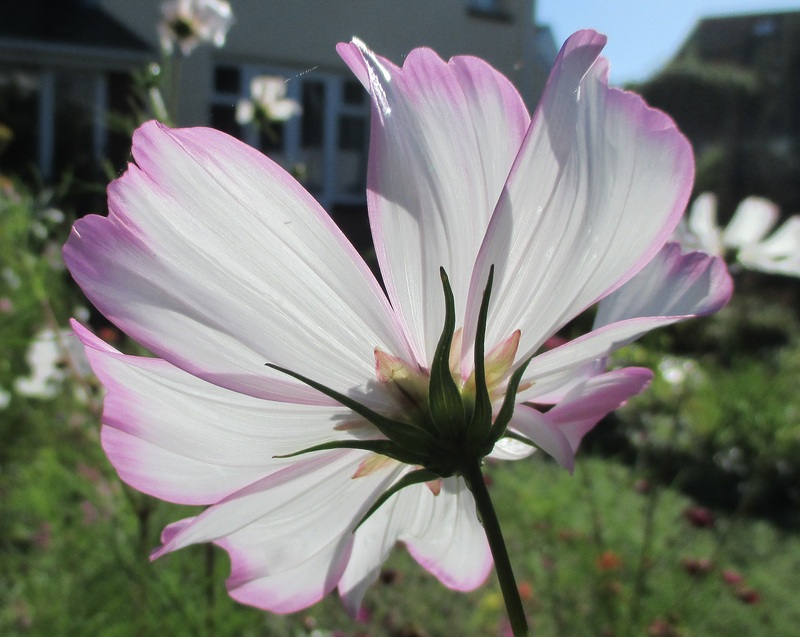 I had forgotten about the lovely cosmos. Thanks for the reminder it’s not too late this year. What is Flying Ant Day? Been sorry to hear about all the fires, hope they are not too close to you. Flying Ant Day is the day when ants get wings and fly off to form new colonies, then the wings fall off and they get building. Happens when the weather is clement, often hot and humid, so FAD could be different in different places. Thanks for the info. The fires are scattered all over the west coast but none near us thankfully.